During an interview with Mehr News, Abolhassan Firouz Abadi, head of Iran’s Supreme Council of Cyberspace mentioned the possibility of some of foreign international social media platforms to move their servers into Iran. “For this matter, there’s a need for a suitable database which we may not be able to provide in the country with ease. This work needs time. Currently Telegram has officially expressed its tendency to move its servers into the country,” said Firouz Abadi. This Iranian official also stated that following the announcement by the government from foreign social networks, a number of them showed interest to move their servers into Iran. “Since the topic is still being negotiated, we can’t name these companies,” he added. Firouz Abadi also dismissed the rumors about the data of Iranian users on Telegram messaging app being hacked. “The Telegram hack is not true and so far it has not been confirmed,” said Firouz Abadi. He also claimed that this messaging app is easy to get hacked since its web based, open-sourced and could be “crawled”. 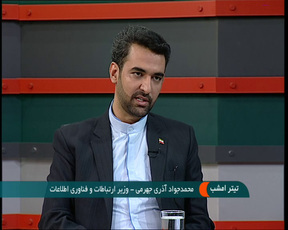 During the interview Firouz Abadi also emphasized on producing locally generated content. “Currently most of the content which is produced in the country over the internet is on social media networks,” said the Head of Supreme Council of Cyberspace when giving reasons for the low volume of locally created content. Firouz Abadi hoped that Iran’s cyberspace could become 50% domestic once some of these social media platforms move their servers into the country. Firouz Abadi also mentioned the lack of any local social media platforms which could satisfy the needs of the Iranian users. Last week Iran’s Head of Digital Media Development Center stated that “53% of Iranians and 72% of the young adults between the age of 18 to 29 are a member of a social media platform”. Creating local social media platforms has become a priority by Iran’s government since a couple of months ago.